As part of our ongoing seminar series, the Centre of Excellence in Severe Asthma hosted A/Prof. David Langton, for a webinar “Bronchial Thermoplasty” on 07 November 2018. This presentation provides an overview of bronchial thermoplasty as a treatment option for severe treatment-refractory asthma. The presentation includes a description of the procedure, how it works, the effects of treatment and complications, patient selection considerations and costs. 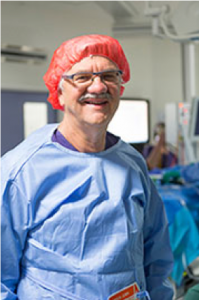 A/Prof David Langton is Director of the Department of Thoracic and Sleep Medicine at Peninsula Health in Melbourne. He graduated as Dux of his year at Monash University in 1981 and trained in both Intensive Care and Respiratory Medicine. He holds Fellowships of the Royal Australian College of Physicians, College of Intensive Care Medicine, the College of Chest Physicians and the Thoracic Society of Australia and New Zealand. He completed a Master of Public Health at Monash in 2016 and is now undertaking a PhD in relation to his work with Bronchial Thermoplasty. He established the Australian Bronchial Thermoplasty register and has published 7 papers in relation to bronchial thermoplasty in the last 18 months. In 2017 he received an Order of Australia Medal for services to the community in respiratory medicine.